As canyons go, it’s not too spectacular if your only point of reference is something grand and American, but the Alcàntara Gorge boasts a very special heritage. It was formed by the waters running off the slopes of Mount Etna and the southern regions of the Nebrodi Montains. Indeed, the Alcàntara River is one of the few streams in Sicily that actually has water all year. Its name comes to us from Sicily’s Arabs; the phrase al qantara means “the bridge” and refers to a Roman span found by the Arabs. The word (but with the accent on the third syllable) also made its way into Spain’s landscape thanks to the Moors. The source of the Alcàntara is near Floresta, which at almost 1,300 meters above sea level is generally considered the highest town in Sicily. To the ancient Greeks it was the Akesines Potamos. The stream’s mouth is near Giardini, where it empties into the Ionian Sea. The Alcàntara Valley was the scene of the all-but-forgotten Battle of Francavilla between Austrian and Spanish forces in June 1719. Over 40,000 troops were involved in what was probably the largest military engagement in Sicily since ancient times, later surpassed by the Allied invasion of 1943. The Spanish won; combined casualties were approximately 8,000 dead or wounded. But this is not the Alcàntara Valley’s only history. Geology has been described as the “history of the Earth.” It tells us that the Alcàntara valley was formed by volcanic stone which crystallized as it cooled rapidly en route from a minor crater atop Etna, a strato volcano having more than one active vent. It took at least a thousand years for the rushing waters – then much more voluminous and forceful than they are now – to form the basalt gorges and “columns” visible today. The formation of Sicily’s other well-known canyons, most notably Cavagrande Cassibile near Noto and Avola Antica, was a more gradual process primarily involving limestone rather than lavic stone. But then everything involving volcanoes is sudden and cataclysmic. 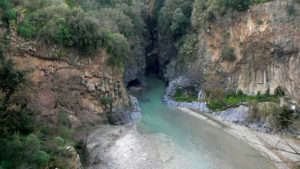 The canyon reaches a depth of around 65 metres, of which some 50 metres are above the average water level, and the water is cool even during Sicily’s hottest summer months. The Alcàntara River parallels route SS185. The main entrance to the gorge is off SS185 near Ficarazzi, a district in the township of Motta Camastra – itself a scenic medieval town straddling a high cliff. It’s possible to take a dip, or hike along the river’s banks, where native vegetation grows. Either choice makes a great excursion from Taormina.